SAW051735 SCOTLAND (1953). Tollcross Park, Glasgow. An oblique aerial photograph taken facing north. Title [SAW051735] Tollcross Park, Glasgow. An oblique aerial photograph taken facing north. Entrance to British Dyewood Co.
Shettleston Rd. looking towards Lamplighting Dept. St. Marks Primary, burnt down 2012. 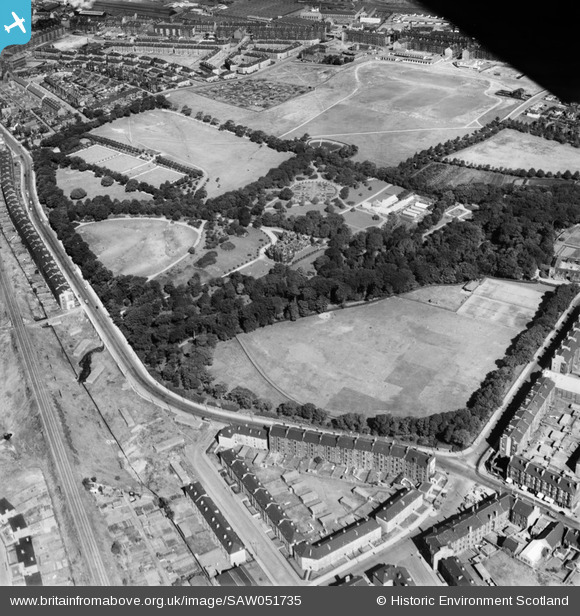 Site of the old "Greens Picturedrome"
Powfoot Street/Beattock Street ~ Parkhead Juniors Park. The club was founded in 1880 and was sometimes referred to as Parkhead Football Club. Their first ground was at the Sheddens where Old Shettleston Road and Shettleston Road meet. From there they moved to Powfoot Street/Beattock Street and their ground was known as Helenslea Park, although they were known to have played some games at Helenvale Park. They were five times winners of the Scottish Junior Cup in 1899, 1903, 1915, 1920 and 1924 as well as being runner-up on four other occasions. They were at one time the oldest team in the Scottish Junior League. Their third and final ground was once again named Helenslea Park and was located at Cuthelton Street. The club became defunct in 1964. Tollcross Park Museum, now private flats. Went to the B.B. (Glasgow 126) in here.